Keep in the water while releasing. During summer months, we hear reports of big bass dying from stress of landing and handling in warm temperatures. One lake recently had heavy weekend fishing pressure with catches to 10 pounds, 10 ounces. The following day, the ranch manager found two floating carcasses. Even though turtles had consumed part of one, remains still weighed over eight pounds. The second tipped scales near seven pounds. There were no other dead fish to suggest a damaging water quality event. Years ago, I watched a companion land an 8.4- pounder in August temperatures. He never removed her from the water and executed quick release. Sadly, she rolled on her side and didn’t survive extended efforts at resuscitation. At least the grand lady holds a place of honor in his den. We understand your frustration. You followed a successful plan and invested five or more years growing eight to 10-pound hulks. It’s time to celebrate by catching and admiring a few. Safely savoring that moment requires delicate procedures this time of year. 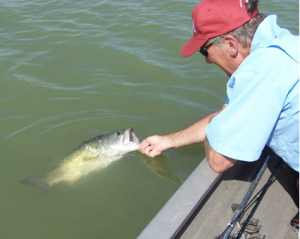 Keep in mind; eight to 10-pound bass are entering senior citizen age. 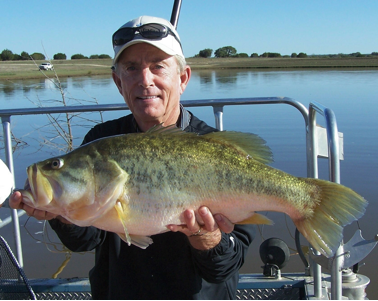 The average life expectancy of a largemouth is 10-years. Those fish could be six to eight years old. Imagine yanking them from a shaded, cool, 10-foot depth to a shocking near 90-degree surface temperature. That’s stress! Like leaving air-conditioned comfort and getting in a sweltering car. Some of us relate when recalling that mowing the lawn at age 65 isn’t as easy as it was at 35. Cradle lunkers. Don’t hold by the jaw. During this season, fish early morning and late afternoon to sundown. Working a topwater on a moon-lit night is exciting. Land and release fish quickly. Keep them in the water while unhooking. Please don’t hold them for extended periods to photograph. A bass can breathe out of water about as long as we can hold our breath. Soft plastic baits are popular now. If one swallows the hook, cut the line, and leave it. Surprisingly, body chemistry will erode the hook and cause less injury than attempted removal. Don’t hold big bass horizontally by the jaw. It could break the jaw. If holding horizontally, place your hand under their stomach to support weight. Harvested fish should be placed in a cooler with ice. They will not survive current surface water temperatures on a stringer or in a live well. Use barbless hooks any time of the year. This entry was posted on Tuesday, June 12th, 2018 at 3:38 pm	and is filed under Articles, News & Updates. You can follow any responses to this entry through the RSS 2.0 feed. Responses are currently closed, but you can trackback from your own site.